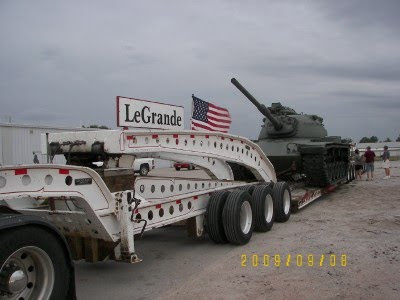 We took 3 trips around town this afternoon, watching for this WWII tank to make it's appearance for our Military Museum. Here it is, safely parked for the night in one of the vacant lots and will be installed in the morning. When you live in a small town, these kinds of things are important. We have numerous WWII soldiers in our town, and almost everyone knows who they are, and how they served. 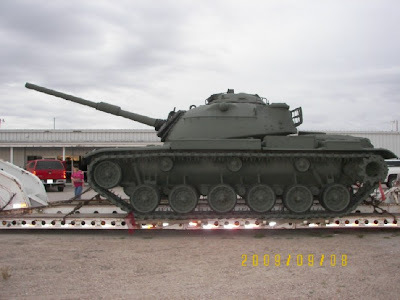 The tank (no longer functional) was donated by the town of Millard (Omaha area) because they no longer needed it, and the transportation and additional costs were donated my local residents. It will be transferred to another vehicle, then taken off THAT vehicle with a crane and set up on the new pad. I hope we can watch part of it's installation in the morning. I would have liked to see this as it was on the Interstate! I'll bet a lot of drivers were looking! Very cool. I just learned this past weekend that all tanks have automatic transmissions - who'da thunk it? Grendelskin - I doubt I could clutch and shift if I were being fired on! Automatic trasmission is a good idea! You're right - I would have loved to have seen that going down the interstate. We had a Civil War cannon in my home town, mounted on a pedestal in the guy's front yard, pointing at the main street through town. It gave some first-time visitors a startled second or two!